Prepare 12 plastic shot glasses by spraying each lightly with cooking spray. With a paper towel, wipe all but a trace layer out. This step will help the jello shots to release later. Place in the refrigerator until the gelatin has firmly set, three hours or more. 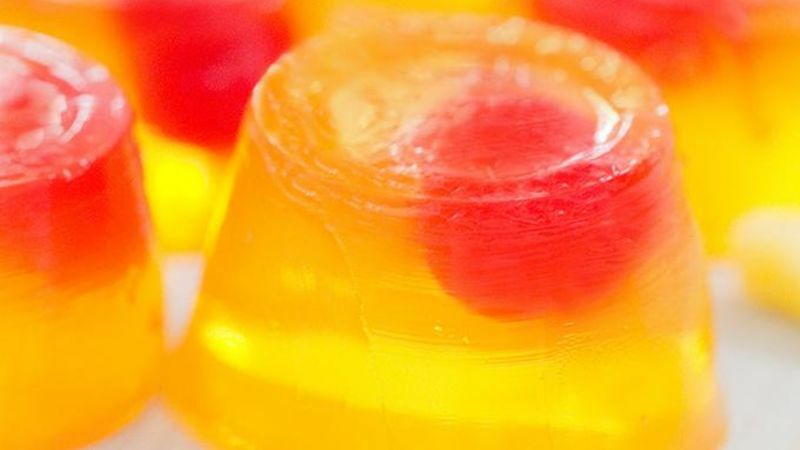 To serve, set jello shots on counter at room temperature for a few minutes until they release easily when tipped upside down. Place on a serving tray and serve immediately. If you like pineapple upside down cake, you'll love these! Little jelly shots that taste of pineapple and bright red Maraschino cherries! What do you get when you take a classic, vintage cake idea and turn it into delicious jelly shots? An amazing treat that will rock your party! I think grandma would approve after just one taste of these Pineapple Upside Down Jelly Shots. I was pretty impressed with the thought of these delicious shots – and just had to try my hand at making them. Using not one, but a couple different varieties of alcohol, pineapple gelatin and some bright red Maraschino cherries (let's be honest, the bright red ones make the recipe vintage! ), we found ourselves loving these mini bite-sized jelly shots! They're very Amy Sedaris, if you will. Try a few to be whisked away to the classic flavor of pineapple upside-down cake ... but make sure you don't overdo it! Pineapple upside down party time!